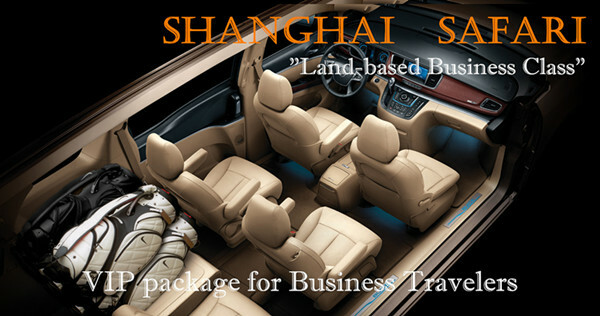 Welcome aboard SHANGHAI SAFARI – our VIP Business travel package. This is our Land-based Business Class service exclusive to our discerning customers. Based on our extensive experience, we have developed a package to satisfy the demanding requirements of a business traveler. What can you expect from this package? a new 7-seat Buick GL8 with spacious working space. a professional driver with over 15 years of safe driving experience. an interpreter with extensive business and engineering background. GPS Navigator, wifi setup, notebook computer, ipad and many office essentials are standard offerings in our vehicle. We are truly a mobile office. mineral water/snacks/choice of CDs/chewing gum/tissue… help you to kick back and relax. When you come aboard, we will make sure you hit the road running in China for a successful business trip. This package is perfect for the business person who demands high quality support while in China and follow-up service later. We are known for attention to details. We have limited time slots for this service. Please click here to book your package. Remember to add “Shanghai Sarafi” in Subject line. All our SHANGHAI SAFARI clients automatically become our VIP customers. They qualify for free sourcing service of three products a year from China. They will also enjoy discounts of 5-10% on subsequent SHANGHAI SAFARI packages.